Flax (Linum usitatissimum) is an oilseed produced predominantly in the northern Great Plains and Canada (Berglund and Zollinger, 2002). Traditionally, flax is crushed to produce linseed oil for industrial applications, and the resultant flaxseed (also called linseed) meal is used as a protein supplement in livestock feeds. Research indicates several possible human health benefits associated with the consumption of flax (Conners, 2000). Flax contains approximately 20 percent alpha-linolenic acid (ALA; dry-matter [DM] basis), an essential omega-3 fatty acid that is a precursor for eicosapentaenoic acid (EPA), which in turn is a precursor for the formation of eicosanoids. Eicosanoids are hormonelike compounds that play an essential role in livestock’s immune response. Additionally, some evidence suggests EPA can elongate further to docosahexanoic acid (DHA), an omega-3 fatty acid that is essential for cell membrane integrity, as well as brain and eye health (Conners, 2000). Flax also is the richest plant source of the lignan precursor secoisolariciresinol diglycoside (SDG), which is converted to mammalian phytoestrogens by the rumen microorganisms or the hind gut microorganisms in nonruminant animals (Thompson et al., 2004). Phytoestrogens are thought to have potential uses in hormone replacement therapies and cancer prevention (Harris and Haggerty, 1993). Research indicates that products, such as eggs and beef, from animals fed flax have increased levels of omega-3 fatty acids (Scheideler et al., 1994; Maddock et al., 2003; Alvarado-Gilis, 2015). This has led to a renewed interest in flax production and feeding flax to livestock. Similar to most grains and oilseeds, the composition of flax can vary based on environmental factors, variety and method of analysis (Daun et al., 2003). Limited data are available on the proximate (nutritive) analysis of flax. Values most commonly used are 41 percent oil, 20 percent protein and 28 percent dietary fiber (Canadian Grain Commission, 2001; DM basis). Reported protein values range from 18.8 to 24.4 percent (Daun and Pryzbylski, 2000). 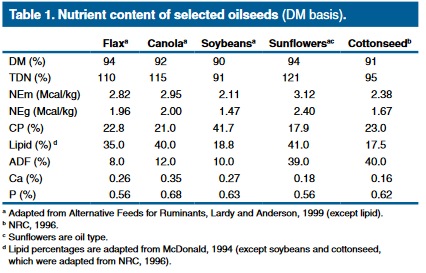 When compared with other oilseeds (Table 1), flax falls between soybeans and sunflowers (oil type) in energy content and is similar to sunflowers, canola and cottonseeds for crude protein content. 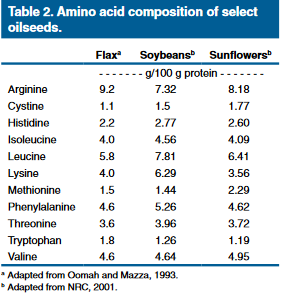 The amino acid composition of flax is similar to soybeans (Table 2). Flax is a rich source of polyunsaturated alpha-linolenic acid (ALA; Figure 1), an omega-3 fatty acid. This differs from other oilseeds such as soybeans, cottonseed and sunflowers, and cereal grains such as corn, that are lower in omega-3 fatty acids and higher in omega-6 polyunsaturated linoleic acids. Additionally, flax is lower in saturated fatty acids, compared with soybeans, cottonseed and corn. Figure 1. 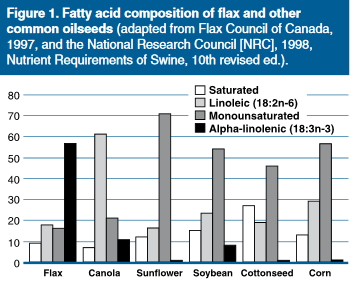 Fatty acid composition of flax and other common oilseeds (adapted from Flax Council of Canada, 1997, and the National Research Council [NRC], 1998, Nutrient Requirements of Swine, 10th revised ed.). 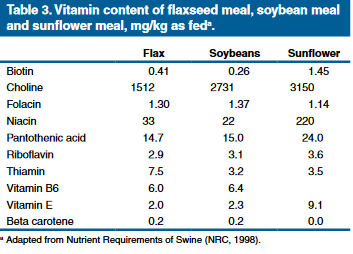 Table 3 lists the vitamin content of flaxseed meal, soybean meal and sunflower meal. Flaxseed meal is lower in choline and higher in thiamin than soybean meal or sunflower meal. Flaxseed meal is similar to soybean meal in most other vitamins. Table 4 lists the mineral content of flax, soybeans and cottonseed. 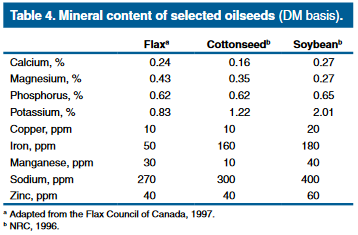 Flax is similar to soybeans in mineral content, with the exception that flax is lower in potassium and higher in magnesium than soybeans or cottonseed. Because flax is high in oil (35 percent; McDonald, 1994), it is considered a fat source in livestock rations. Fats traditionally have been used in livestock diets to increase energy density, reduce dust, eliminate fines and aid in processing such as pelleting (Byers and Schelling, 1988). Generally, fat is limited to 5 percent of DM in ruminant diets because fats can interfere with rumen fermentation (Byers and Schelling, 1988). Using this rule, flax may be added at 12 to 14 percent (DM basis) to ruminant diets. This appears to hold true when using flax in beef cattle diets, as Drouillard et al. (2004) offered beef steers 0, 5, 10 and 15 percent flax and noted a linear decrease in DM intake as flax levels increased. Additionally, because of its relatively high protein content (22.8 percent; Lardy and Anderson, 1999), flax might be considered a source of supplemental protein; however, considerations for oil content may limit the amount of protein that flax might add in a ruminant diet. Several studies have included flax in beef feedlot rations with mixed results. Drouillard et al. (2002) fed flax at 0, 5, 10 and 15 percent of diet DM and found that when fed at 5 percent of DM, flax increased DM intake but did not affect gain or gain efficiency. Additionally, Drouillard et al. (2002) investigated the timing of flax inclusion by feeding flax at zero percent (diet DM) for 109 days, 5 percent for 109 days, 5 percent for the first 60 days and zero percent for the last 49 days, or zero percent for the first 60 days and 5 percent for the last 49 days. All treatments had similar gain (3.75 ± 0.64 pound/day), DM intake (19.6 ± 2.7 pounds/day) and gain efficiency (0.19 ± 0.01 gain:feed). Alvarado-Gilis et al. (2015) investigated the addition of dolomitic lime hydrate to ground flaxseed as a means of reducing ruminal biohydrogenation of the fatty acids in flax. This treatment resulted in lowered final weights and lowered average daily gain due to adverse effects on dry-matter intake in finishing heifers. Maddock et al. (2004) fed whole or processed (rolled or ground) flax included at 8 percent of the diet DM and reported significant increases in gain and gain efficiency and no differences in DM intake (Table 5), when compared with a corn-based control diet. Additionally, data from this study suggests that processing flax is necessary to optimize gain and nutrient utilization. When flax was rolled or ground, gain and gain efficiency increased, compared with feeding whole flax. Goodridge et al. (2001) fed lactating dairy cows casein-protected flax at 1.76 or 3.53 pounds per pound of milk fat produced and Ward et al. (2002) fed lactating dairy cows solin (or linola, a cultivar of flax), flax and canola at 8 percent of the diet DM. No differences in milk production were found in either trial. Kennelly and Khoransani (1994) fed four levels of flax (0, 5, 10 and 15 percent diet DM) and noted no differences in intake or milk yield. Goodrich et al. (2001) reported that flax-fed cows produced milk higher in protein, compared with cows fed casein-protected linola, a variety of solin that is high in linoleic acid (18:2). Ward et al. (2002) compared flax to solin, canola and a control (barley and silage based) diets and reported that cattle fed flax diets had lower milk protein yields (expressed as pounds/day or a percentage) than cows fed the control diet. Kennelly and Khoransani (1994) also reported that as dietary flax levels increased, milk protein decreased. Feeding flax can alter milk fatty acid profiles. Kennelly and Khoransani (1994) fed 0, 5, 10 or 15 percent (DM) whole flax seed to midlactation Holstein cows and reported linear increases in milk long-chain fatty acids and polyunsaturated fatty acids, including ALA, as the flax level increased. Additionally, Goodridge et al. (2001) reported that milk levels of ALA increased linearly with increasing dietary flax inclusion. Petit et al. (2001) fed 17 percent formaldehyde-protected whole flax to lactating dairy cows and reported increased milk ALA levels, compared with other fat sources. Ward et al. (2002) fed 8 percent canola, solin or flax to dairy cows and reported increases in milk ALA content for those cows fed the flax diet. Resende et al. (2015) noted decreased milk yield but increased cis-9, trans-11 18:2 and n-3 fatty acids when 15 percent flax was fed to Jersey cows fed a 63:37 forage-to-concentrate ratio ration. Numerous reports show how flax and/or its components (specifically ALA and SDG) are beneficial to human health, including reducing the risk of heart disease and stroke, modulating autoimmune disorders such as lupus and nephropathy, and decreasing incidences of certain cancers (Conners, 2000; Thompson et al., 2004). Research on animal health generally has been limited to beef feedlot cattle and, to some degree, dairy cattle. Drouillard et al. (2002) conducted two experiments with newly weaned calves to evaluate the effect of flax inclusion in receiving rations on morbidity. In experiment 1, 370 steer calves were fed 0, 5, 10, 15 or 20 percent flax or 4 percent tallow for 36 to 40 days, and no differences were observed for cases of bovine respiratory disease (BRD). In experiment 2, weaned heifer calves were fed no flax, 4 percent tallow, 10 percent flax, 4 percent flax oil or linseed meal with 4 percent tallow for 40 or 41 days. Incidences of BRD were greatest in heifers fed the control diets. Compared with tallow, flax and flax oil treatments had fewer heifers retreated for BRD. Farren et al. (2002) fed 4 percent tallow, 12.9 percent flax and an algae source of DHA to evaluate the effects on immune response. Diets were fed to feedlot steers for 14 days prior to an injection of lipopolysaccharide (LPS) endotoxin as an immune challenge. Flax-fed steers had lower rectal temperatures three to six hours after LPS injection, compared with tallow- and algae-fed steers, and flax-fed steers had higher blood levels of haptoglobin, a positive indicator of immune response, compared with tallow-fed steers. Petit et al. (2001) reported increased first-service conception rates (87.5 vs. 50 percent) in dairy cows fed 17 percent flax, compared with dairy cows fed other sources of fat. The authors attributed this response to increased energy balance for the cows fed the flax diet. Bork et al. (2010) conducted a study on commercial dairies to investigate the effects on milk production and reproductive parameters. They fed 0.85 kilogram of flax daily to lactating dairy cows. No differences in milk production or reproductive parameters were noted, but milk fatty acid composition was influenced, with cows fed flax producing milk that contained greater proportions of cis-9, trans-11 C18:2, C18:3n-3 and C20:0 fatty acids. Jahani-Moghadam et al. (2015) noted that Holstein cows fed extruded flaxseed returned to estrus earlier and had lowered incidence of cyclic follicles. Days open, the number of services per pregnancy and pregnancy rate did not differ. Because flax is high in fat, considerable interest has been expressed in using flax to enhance U.S. Department of Agriculture quality grade. Research in this area has provided mixed results. Maddock et al. (2003) included 3 or 6 percent ground flax in finishing diets for feedlot steers fed for 56 days prior to harvest. No differences were noted for carcass characteristics, including 12th-rib fat thickness, rib-eye area, or USDA yield and quality grades. In a second experiment, Maddock et al. (2004) included flax at 8 percent of DM in diets for feedlot heifers and determined flax had a tendency (P = 0.14) to increase marbling scores. Additionally, Drouillard et al. (2004) fed Holstein steers 0 or 5 percent flax for 109 or 157 days and reported that flax addition increased the percentage of steers that graded USDA Choice. What is unclear is if using flax will affect cutability and yield of beef carcasses. Drouillard et al. (2004) fed increasing levels (0, 5, 10 or 15 percent flax) to beef steers and noted a quadratic response to flax for USDA yield grade. Flax added at 5 or 10 percent of DM resulted in steers with greater USDA yield grades than those steers fed 0 or 15 percent. These results are similar to those found by Maddock et al. (2004), who reported that flax included at 8 percent of the diet DM increased USDA yield grade. Conversely, Drouillard et al. (2004) reported that feeding 5 percent flax to Holstein steers did not affect USDA yield grades. Due to an increase in consumer interest surrounding dietary omega-3 fatty acids, researchers have hypothesized that flax inclusion in feedlot diets will alter end product fatty acid profiles positively, and research has proven that this occurs. Muscle from steers fed diets that included flax had higher ALA content (47 grams per kilogram [g/kg] lipid), compared with those steers fed basal-corn (34 g/kg lipid) or barley (39 g/kg lipid) diets (Maddock et al., 2003). Steers fed 5 percent flax had higher muscle levels of ALA than steers fed no flax (Drouillard et al., 2002), and Drouillard et al. (2004) reported increased ALA content in muscle and fat samples collected from Holstein steers fed 5 percent flax for 109 or 157 days, compared with control steers. Maddock et al. (unpublished data) found increases in phospholipid and neutral lipid ALA fractions from cattle offered 8 percent flax vs. a corn/linseed meal control diet. The researchers also noted that feeding 8 percent flax increased phospholipid longer-chain omega-3 fatty acids such as EPA, docosopentanoic acid (DPA; 22:5n-3) and DHA. Drouillard et al. (2000; 2004) also reported increases in EPA and DHA in beef from cattle offered 5 percent or greater flax. Alvarado-Gilis et al. (2015) fed increasing levels of ground flaxseed or dolomitic lime-treated ground flaxseed to finishing heifers (0, 3 or 6 percent). Both treatments increased the concentration of α-linolenic acid in the meat. Treatment with the dolomitic lime increased α-linolenic acid in the meat 47 percent, compared with ground flaxseed. Due to increases in unsaturated fatty acids in flax-fed beef, Drouillard et al. (2004) investigated the use of vitamin E in flax-supplemented beef feedlot diets and reported beef from cattle supplemented vitamin E had brighter retail shelf color scores than those not offered flax, but that neither treatment group was considered unacceptable to consumers. Drouillard et al. (2004) also noted no differences in lipid oxidation of fatty acids in beef from flax-fed cattle and cattle fed control diets. Literature on how feeding flax to cattle affects palatability of the resultant meat product also is unclear. Sensory panel results (Maddock et al., 2003; 2004) suggested that flax-fed steers produced strip steaks that were less juicy, compared with steers fed basal-corn diets. In contrast, Drouillard et al. (2004) reported no differences in sensory panel observations for juiciness, tenderness or flavor. Maddock et al. (2004) also found that feeding 8 percent flax to feedlot heifers resulted in steaks that had lower Warner-Bratzler shear force values, which suggests that steaks should be more tender, when compared with steaks from heifers fed a corn-based control diet. However, Drouillard et al. (2004) reported no differences in steak shear force values from flax-fed cattle when compared with steaks from cattle fed control diets. Turner et al. (2015) fed 14 percent flaxseed to forage-fed cattle and produced ground beef following the feeding regimen. Their data indicated that the fat source had minimal effects on sensory attributes but that feeding flaxseed did increase off-flavor intensity in hamburgers. Flax can serve as a useful source of nutrients for beef and dairy cattle. It is high in protein and an excellent source of energy and essential fatty acids. Flax also can be used to fortify foods with omega-3 fatty acids. Research has shown that including flax in cattle diets increases the level of ALA, an essential omega-3 fatty acid, in the resultant meat and milk. Niche marketing to certain health-conscious consumers could add value to food products from flax-fed livestock. C.A. Alvarado-Gilis, C.C. Aperce, K.A. Miller, C.L. Van Bibber-Krueger, D. Klamfoth and J.S. Drouillard. 2015. Effects of flaxseed encapsulation on biohydrogenation of polyunsaturated fatty acids by ruminal microorganisms: feedlot performance, carcass quality, and tissue fatty acid composition. J. Anim. Sci. 93:4368–4376. Berglund, D.R., and R.K. Zollinger. 2002. Flax production in North Dakota. North Dakota State University Extension Service publication. A1038. Bork, N.R., and J. W. Schroeder, G.P. Lardy, K.A. Vonnahme, M.L. Bauer, D.S. Buchanan, R.D. Shaver and P.M. Fricke. 2010. Effect of feeding rolled flaxseed on milk fatty acid profiles and reproductive performance of dairy cows. J. Anim. Sci. 88:3739–3748. Byers, F.M., and G.T. Schelling. 1988. Lipids in ruminant nutrition. Pages 298-312 In: The Ruminant Animal, D.C. Church, Waveland Press, Prospect Heights, Ill.
Canadian Grain Commission. 2001. Nutritional profile of No. 1 Canada Western flaxseed and of yellow flaxseed samples. Canadian Grain Commission, Winnipeg, MB. Conners, W.E. 2000. Importance of n-3 fatty acids in health and disease. Am. J. Clin. Nutr. 71: 171S-175S. Daun, J.K., V.J. Barthet, T.L. Chornick and S. Duguid. 2003. Structure, composition, and variety development of flaxseed. In: Flaxseed in Human Nutrition, 2nd ed., AOCS Press, Champaign, Ill., pp. 1-40. Daun, J.K., and R. Przybylski. 2000. Environmental effects on the composition of four Canadian flax cultivars. Proc. 58th Flax Institute, March 23-25, 2000, Fargo, N.D. pp 80-91. Drouillard, J.S., T.B. Farran, D.A. Blasi, H.J. LaBrune, S.P. Montgomery, J.J. Sindt, C.M. Coetzer, R.D. Hunter, M.F. Spire, T.H. Elsasser and J.J. Higgens. 2000. Modulation of immune response in feeder cattle with flaxseed. Proc. 58th Flax Institute, March 23-25, 2000, Fargo, N.D. pp 53-62. Drouillard, J.S., E.J. Good, C.M. Gordon, T.J. Kessen, M.J. Sulpizio, S.P. Montgomery and J.J. Sindt. 2002. Flaxseed and flaxseed products for cattle: Effects on health, growth performance, carcass quality, and sensory attributes. Proc. 59th Flax Institute, March 21-23, 2002, Fargo, N.D. pp 72-87. Drouillard, J.S., M.A. Seyfert, E.J. Good, E.R. Loe, B. Depenbusch and R. Daubert. 2004. Flaxseed for finishing beef cattle: Effects on animal performance, carcass quality, and meat composition. Proc. 60th Flax Institute, March 17-19, 2004, Fargo, N.D. pp 108-117. Farren, T.B., J.S. Drouillard, D.A. Blasi, H.J. LaBrune, S.P. Montgomery, J.J. Sindt, C.M. Coetzer, R.D. Hunter and J.J. Higgens. 2002. Evaluation of performance in receiving heifers fed different sources of dietary lipid. Pages 1-4 in Proc. 2002 Cattlemen’s Day, Kansas State University, Manhattan. Flax Council of Canada. 1997. Contractual analysis. In: Flax – A health and nutrition primer. D.H. Morris. Flax Council of Canada, Winnipeg, MB. Goodridge, J., J.R. Ingalls and G.H. Crow. 2001. Transfer of omega-3 linolenic acid and linoleic acid to milk fat from flaxseed or Linola protected with formaldehyde. Can. J. Anim. Sci. 81: 525-532. Harris, R.K., and W.J. Haggerty. 1993. Assays for potentially anticarcinogenic phytochemicals in flaxseed. Cereal Foods World 38: 147-151. Jahani-Moghadam, E. Mahjoubi and E. Dirandeh. 2015. Effect of linseed feeding on blood metabolites, incidence of cystic follicles, and productive and reproductive performance in fresh Holstein dairy cows. J. Dairy Sci. 98:1828–1835. Kennelly, J.J., and G.R. Khorasani. 1992. Influence of flaxseed feeding on fatty acid composition of cows’ milk. Proc. 54th Flax Institute, Jan. 30-31, 1992, Fargo, N.D. pp 99-105. Lardy, G.P., and V.L. Anderson. 1999. Alternative feeds for ruminants. North Dakota State University Extension Service publication AS1182. Maddock, T.D., V.L. Anderson, P.T. Berg, R.J. Maddock and M.J. Marchello. 2003. Influence of level of flaxseed addition and time fed flaxseed on carcass characteristics, sensory panel evaluation, and fatty acid content of fresh beef. Proc. 56th Reciprocal Meats Conference, Am. Meat Sci. Assoc., Columbia, Mo. Maddock, T.D., M.L. Bauer, K. Koch, V.L. Anderson, R.J. Maddock and G.P. Lardy. 2004. The effect of processing flax in beef feedlot rations on performance, carcass characteristics, and trained sensory panel ratings. Proc. 60th Flax Institute, March 17-19, 2004, Fargo, N.D. pp 118-123. McDonald, B.E. 1994. Canola oil nutritional properties. Canola Council of Canada. Winnipeg, MB. NRC. 1996. Nutrient requirements of beef cattle 7th Rev. Ed. National Academy Press, Washington, D.C.
NRC. 1998. Nutrient requirement of swine. 10th Rev. Ed. National Academy Press, Washington, D.C.
NRC. 2001. Nutrient requirements of dairy cattle. 7th Rev. Ed. National Academy Press, Washington, D.C.
Oomah, B.D., and G. Mazza. 1993. Flaxseed proteins – A review. Food Chem. 48: 109-114. Petit, H.V., R.J. Dewhurst, J.G. Proulx, M. Khalid, W. Haresign and H. Twagiramungu. 2001. Milk production, milk composition, and reproductive function of dairy cows fed different fats. Can. J. Anim. Sci. 81: 263-271. Plascencia, A., M. Estrada and R.A. Zinn. 1999. Influence of free fatty acid content on the feeding value of yellow grease in finishing diets for feedlot cattle. J. Anim Sci. 77: 2603-2609. Resende, T.L., J. Kraft, K.J. Soder, A.B.D. Pereira, D.E. Woitschach, R.B. Reis and A.F. Brito. 2015. Incremental amounts of ground flaxseed decrease milk yield but increase n-3 fatty acids and conjugated linoleic acids in dairy cows fed high-forage diets. J. Dairy Sci. 98:4785–4799. Scheideler, S.E., S. Cuppett and G. Froning. 1994. Dietary flaxseed for poultry: Production effects, dietary vitamin levels, fatty acid incorporation into eggs and sensory analysis. Proc. 55th Flax Institute, Jan. 26-28, 1994, Fargo, N.D. pp 86-95. Thompson, L.U., J. Chen, E. Hui, J. Mann and T. Ip. 2004. Interactive effects of flaxseed and tamoxifen on human breast cancer. Proc. 60th Flax Institute, March 17-19, 2004, Fargo, N.D. pp 86-90. Turner, T.D., J.L. Aalhus, C. Mapiye, D.C. Rolland, I.L. Larsen, J.A. Basarab, V.S. Baron, T.A. McAllister, H.C. Block, B. Uttaro and M.E.R. Dugan. 2015. Effects of diets supplemented with sunflower or flax seeds on quality and fatty acid profile of hamburgers made with perirenal or subcutaneous fat. Meat Science. 99:123–131. Ward, A.T., K.M. Wittenberg and R. Przybylski. 2002. Bovine milk fatty acid profiles produced by feeding diets containing solin, flax and canola. J. Dairy Sci. 85: 1191-1196. Zinn, R.A., S.K. Gulati, A. Plascencia and J. Salinas. 2000. Influence of ruminal biohydrogenation on the feeding value of fat in finishing diets for feedlot cattle. J. Anim Sci. 78: 1738-1746.